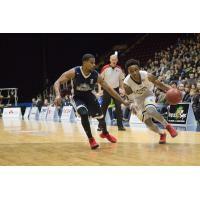 It only took the Halifax Hurricanes one quarter to adjust to a new floor and new city as they won their first-ever game in St. John's Newfoundland against the Edge with a final score of 116-114. The Hurricanes started the game slow against the unfamiliar opponent, giving up 34 points in the opening frame, but managed to come right back in the second to outscore the Edge by 17 points before the halftime break. During the third quarter, veteran point guard Cliff Clinkscales may have sensed his team needed some inspiration. He drained five threes right in a row on his way to a 20-point 10-assist performance. In the dying seconds of the fourth quarter, the St. John's Edge tied the game with a three-pointer. Just as overtime seemed inevitable, Clinkscales found Rhamel Brown alone under the hoop for the lay with the foul that lifted the Hurricanes to their 116 points. Billy White also had a huge game for the Hurricanes. The Edge could not match his athleticism down low. He put up 31 points and brought down 15 rebounds while finding teammates with four assists. The Hurricanes got a big off-the-bench contribution from Mike Poole as well. He had 20 points and eight rebounds. With that win, the Hurricanes take sole-possession of the best record in the league at 22-10. The Hurricanes play again in St. John's on Wednesday night and will likely face the National Basketball League of Canada's leading scorer Carl English who rested for Tuesday night's game. You can watch that game live on HalifaxHurricanes.ca. After that, the Hurricanes are home for a week's rest before hosting the Moncton Magic at Scotiabank Centre on March 15 at 7 p.m. Get your tickets for that game at the Ticket Atlantic Box Office or online.